I have suffered with tummy troubles just about as long as I can remember. Had many embarrassing tests done to find out it's IBS. I've tried many different approaches to dealing with it, yogurt, high fiber diets and other probiotics. I had little improvements here and there but had to be so careful what I ate, especially if I was somewhere other than home because of the embarrassing "OH NO" that would hit without warning. Anyone who has ever suffered with IBS knows what I'm talking about. 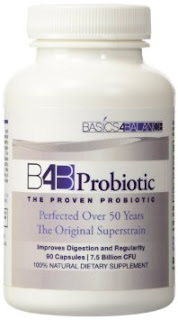 That's why I'm so excited to tell you about B4B Probiotics. This stuff has really helped me! It relieves gas, bloating , diahrrea, weight loss, celiac's, gluten, acid, not to mention the way it boosts your immune system. Nothing has ever helped me the way B4B does. Plus with the holidays right around the corner I can enjoy all the good food with confidence.